With the turn of the year, I decided it was time to create a routine schedule dedicated to my upcoming thru-hike in March. This schedule includes research (materials to read over the trail), testing gear, physical training, budget planning, and shakedown hikes. I plan on diving into all these aspects before the start of my hike, but today is about the lessons learned from this past week. Over the course of the past 5-days I logged 55 miles; nothing too crazy, but it felt good to get my pack on and hit the trails. I didn’t have to deal with much elevation change, but the weather here in Ohio has been freezing. The frigid temperatures have prevented any overnight camping; instead, I’ve focused on a solid hiking pace, properly fitting my pack for comfort, and using trekking poles efficiently. In the past, I’ve done a lot of day/weekend hikes, but nothing to the extent of 100+ days (2200 miles) of hiking. During previous back-country experiences I’ve overloaded my pack and paid the price in blisters and sore muscles; therefore, my goal is to fine tune every resource I can before the take off date gets here in March. One of the many challenges presented this past week was to only use the gear I will have out on the AT. With the wind chills dipping down to -18 degrees, it was near impossible to not grab any warmer clothes than the ones I will be using on my thru-hike; surprisingly, the only substitution I had to make was a pair of winter gloves. I was super excited to hit the trail on day 1, a trail not far from where I live. Being cooped up in school this past semester deepens my appreciation for the freedom experienced in the outdoors, and serenity of the woods. I went out to my car early in the morning, started it up, threw in my backpack, and took off. My pack was full of everything that I am planning on taking along for the AT. I pulled into the empty parking lot at the trail-head, grabbed my backpack, and was ready to go. I had hiked this trail many times before so there wasn’t any research or maps I needed, but after I took my few first steps something felt wrong. I didn’t have my trekking poles, and then I remembered that I had left them in my apartment. About thirty seconds after that, my hands felt really cold, looking down at them I realized I didn’t bring my gloves either. “Dammit,” I said to myself, “I can’t do this out on the AT”. The hike turned out great though; if you think about it, with no trekking poles I could just put my hands in the pockets of my down coat (and that’s what I did). I’m actually really glad that I ran into the situation of being ill prepared so close to home. Right off the bat I was struck with the reminder that meticulously going through all the necessary gear is mandatory before heading out on the trail. The first day of my hike I logged 12 miles, and the second day I was eager to get back out on the trail. This was actually the coldest day of my hikes. I followed the same routine as the previous morning, but this time I remembered my trekking poles. I wanted to test out using wool socks as gloves, because that’s what I’m planning on doing for the AT. Unfortunately, wool socks work great for gloves, which I found out, but not so much in the negative digits. I threw my pack on my back and hiked 13 miles on day 2. I felt sore from my first day out on the trail, but nothing out of the ordinary. When I woke up the third morning for my shakedown hikes I was greeted with intense soreness; even after stretching and doing yoga in both the morning/night I was still super sore. My pack felt so much heavier. I thought maybe I had accidentally slipped a dumbbell into it, but after searching I found nothing. The gravity must have increased! All joking aside, one of the biggest things I learned this past week was cutting pack weight. I really enjoyed my days out on the trail, but many of the items I had in my pack were unnecessary, or poorly designed for a solo thru-hike. At first, I was planning on using a 2-person tent that weighted right around 6.5 lbs. After this past week, I decided against that and upgraded to an MSR Hubba NX Solo. I set a goal to be frugal and use what I already have to take on this challenge; but these shakedown hikes have shown me that some pieces of my gear need upgraded to lighter equipment for less strain (wear and tear) on the body, especially for 2,200 miles. Think of the movie Karate Kid, when Daniel has to wax the car. He didn’t understand why, but if only he understood that Mr. Miyagi knew best. Well, in the past I was like Daniel, only toward all the straps on my hiking pack. On a day or weekend hike, I didn’t see the point in so many straps all over a pack, and rather than properly adjusting these straps, I would just cinch them all down and take off. After being on the trails multiple days in a row I started to think there might be a better way to adjust my pack; that’s when Mr. Miyagi stepped in, in the form of Youtube videos. I may have exaggerated my ignorance for the straps on my pack a bit, but this first series of hikes has shown me the many intricate parts to hiking; whether it may be strategically packing a pack, weight distribution, properly/securely fitting the pack, different ways to use trekking poles, and all the intricacies of each piece of gear. 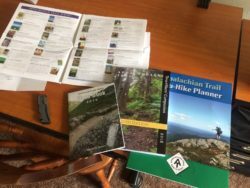 I’ve always been more into the overall experiences than I have been towards being meticulous about aspects such as gear, but it will be a mandatory practice to increase the chances for a successful thru-hike. It’s amazing how many great blogs, journals, and YouTube videos there are to learn from about different techniques of hiking, packing, and using gear. I’ve got 8 more weeks to keep waxing away! 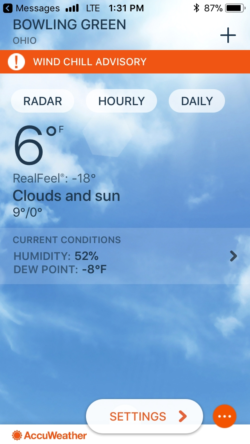 The major thing that needs to happen…it needs to warm up here in Ohio. If it doesn’t, I’ll still go out hiking everyday but it would be nice to see a night in the 30s, in order to get out and camp. I’ve had a great time this past week out on the trails; these hikes have only increased my excitement for the AT. In addition, everyday I feel a little bit more prepared to take on this new adventure. Again, the biggest lessons I took away from the initial training I’ve done so far is to be prepared (have all the necessary gear), cut as much pack weight as possible (then cut some more), and soak up all the resources available about fine tuning every aspect of the hike before hitting the trail. My order of books came in the mail the other day! 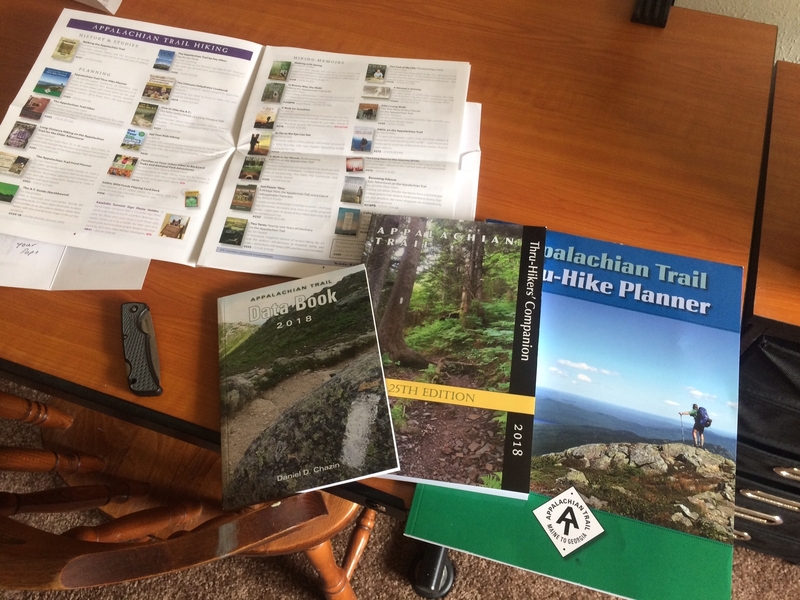 Order yours on the Appalachian Trail Conservancy Website.